We now conclude our exploration of seating arrangements this week by looking at another which has become more common of late – the central arrangement. 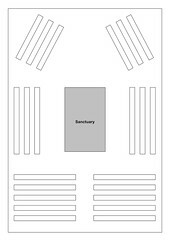 This seating arrangement is characterised by the central location of the sanctuary, or at least the altar, in the worship space (hence the name central arrangement). The seating for the assembly is then arranged around the centrally located altar. One example of the central arrangement can be found in the recently built church of St. John the Baptist, Woy Woy. This seating arrangement is probably most akin to the very earliest spaces of Christian worship outside of the Jewish temples. With the eucharist often celebrated at that time in homes and specially prepared “house churches”, the small communities who gathered would have done so around the table, just as they would have done for other meals. The central arrangement very clearly reflects the understanding that the entire assembly gathers and celebrates the eucharist together. Their very act of gathering to celebrate together makes Christ present; it forms they into the Body of Christ. Like the antiphonal arrangement, people can be concerned about facing others. Addressing this concern at our own St. Patrick’s Cathedral, our diocesan director of liturgy, Fr Peter Williams wrote in Liturgy News of March 2004. He pointed out that such an arrangement of people gathered around the altar is not designed for us to be “distracted”, but to focus on the liturgical celebration, and to be reminded that we ourselves form the Body of Christ when we gather to worship. We are also reminded, consequently, that through the eucharist, we “become what we receive”.